Stephanie Henderson: did u really get a cat ? Stephanie Henderson: whats her name dish !!! Richard L Walker: The 11th hour. Great time to announce what's been known for days. Richard L Walker: Every time I reset I get a single picture on the screen but no real video or audio. BurrenBackroomSeries: Everything's working fine on our end, is anyone else having the same problem? Richard L Walker: I might question everything working fine on your end but since it won't be fixed I might as well head off for some food. Richard L Walker: Chrome is working; Firefox isn't. Richard L Walker: End of show? BurrenBackroomSeries: Sorry about that, our internet stopped working right as they were going on break. Restarting the broadcast to fix any kinks that might have caused. BurrenBackroomSeries: They're currently on break and will be back in a few minutes! Richard L Walker: What did she hit with her foot? ericwonderlich: Get a microphone on the band when they are playing in the audience. Please. scott-cornish: Another winning effort by the CTP! Lovely! Mtndawg: Very interested in learning more about them. A quick look at their site only shows this show as upcoming. BurrenBackroomSeries: Wasn't possible for this show, we used every single channel we had for their band. We know what we're doing here ;] If something isn't done, promise there's a good reason. Mostly. chrisblood: You couldn't wait for the end of the song? A download of "Grace Bay," by Tommy McCarthy and Louise Costello. 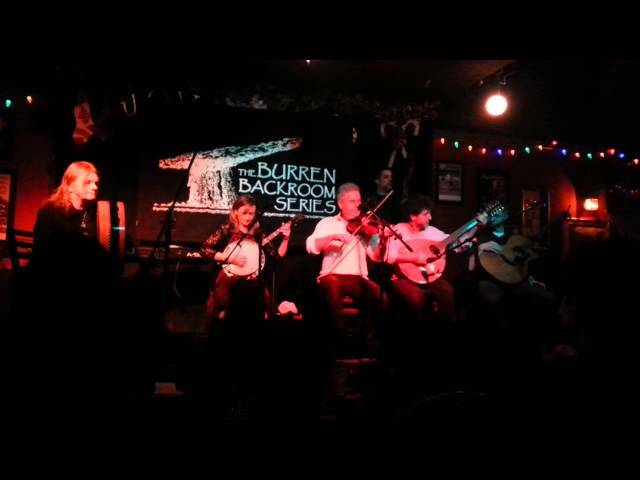 The Burren Backroom Series, launched in October of 2011, has already created many memorable, intimate, informal presentations. These shows are held in a truly atmospheric space, created by well-known traditional musicians Tommy & Louise McCarthy in Davis Square, Somerville, Masachusetts. Wednesday night shows are hosted by Brian O'Donovan of "A Celtic Sojurn" on WGBH radio, these gatherings feature core performers from many aspects of traditional music as well as special guests, & conversations around the music. Thursday, Friday and Saturday nights shows feature an eclectic mix of artists and styles of music.